The statewide trade group Maine Built Boats elected Kerri Russell, operations manager of the John Williams Boat Co., president at its 2011 annual meeting at the Maine Boatbuilders Show at Portland Yacht Services. Three new directors - Drew Lyman, of Lyman-Morse Boatbuilding; Mark Mitchell, of ComMar Sales LLC; and Edward Roberts, of Hodgdon Yachts - joined the board to replace departing members. Russell previously was chairman of the board of the trade group. It was founded in 2004 and has nearly 60 members representing all aspects of boatbuilding in Maine, from small shops building canoes and kayaks to large companies that build some of the world&apos;s finest luxury yachts. In opening remarks at the March 19 meeting she acknowledged the contributions and service of long-term president Jane Wellehan, who stepped down in January after three-and-a-half years at the helm. "She did great things for the organization," Russell says. Tricia Grant of Bar Harbor was hired to handle administrative duties and provide continuity now that Russell is president. Russell says the trade group has made progress on its financial challenges by reducing costs as revenue from sponsorships has increased. The group had received substantial financial support from a federal Workforce Innovation in Regional Economic Development grant that Maine&apos;s North Star Alliance administered. The grant allowed the group to place ads in magazines, attend boat shows and participate in an overseas trade mission that the organization&apos;s internal funds alone would not have supported. "We have scaled the organization back in order to live within our means now that the WIRED funding is over," she says in a subsequent e-mail. "We are confident that the organization is sustainable on its own." Although the boating industry is starting to grow again, the recession has made it difficult for some companies to remain members. The group has adopted a credit card system for dues payments to make it easier to participate. The group will continue successful outreach efforts such as the Open Boatyard Days promotion it started last year. The program invites people to go behind the scenes at participating companies. Again this year it will be held on the Monday and Tuesday that follow the annual Maine Boats, Homes & Harbors Show (Aug. 12-14) in Rockland. "The state is big, Rockland is kind of centered and people wanted to visit builders north and south, so we have it open for two days to do that," Russell says. "Significant numbers" of visitors were at last year&apos;s event, ranging from the curious who might not have seen a boatyard before to those with a serious interest. "It actually developed work," Russell says, noting that a company "east of Ellsworth" got two significant service jobs as a result of the program. "Those people who aren&apos;t necessarily qualified buyers that come through are also voters," says board member John Hanson, who heads the publishing company that produces the Rockland show. "If they have an understanding of what our industry is, it may help us with the legislature." Another step the trade group is taking is to pursue project funds from the Maine Technology Institute, and it has engaged Del Greco Strategic Partners, a Brunswick-based consultancy, to assist the grant-writing effort. The institute is a publicly funded non-profit corporation that "offers early-stage capital and commercialization assistance in the form of competitive grants, loans and equity investment for the research, development and application of technologies that create new products, processes and services, generating high-quality jobs across Maine." Sandy Spaulding, a board member of the trade group, emphasized to the members at the meeting that the state&apos;s marine trades cluster is seen as analogous to California&apos;s Silicon Valley for information technology companies. In the seven years since Maine Built Boats was founded, he says, "that statement alone means we&apos;ve made an impression on the legislature and the people in the state about the Maine marine trades." One area of the marketing effort that will receive more attention is the Internet, which has become an important tool in all types of commerce. 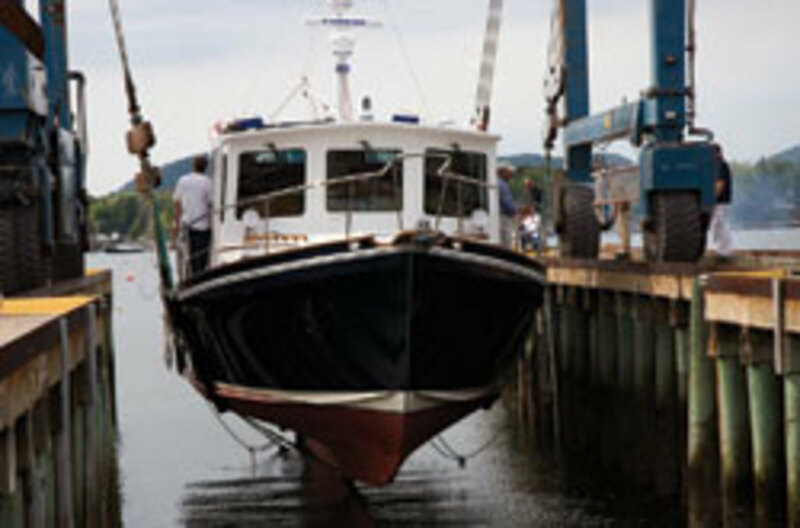 Maine Built Boats has contracted with a division of Maine Boats, Homes & Harbors Inc. to refocus the organization&apos;s marketing and communications efforts. The work will be led by veteran multimedia producer and interactive project manager Jamie Bloomquist. "We&apos;re going to continue with e-mail marketing," Bloomquist says, "and continue to reach out on the social media side to make sure that we&apos;re keeping the story out in front of people through as many opportunities as we can." He noted that the group now has a Facebook page and he encouraged Maine Built Boats members to take part in the marketing effort by contributing news items and participating actively on Facebook. Summing up the organization&apos;s goals, Russell says, "In the short term we hope to maximize the impact of our website by making it more user-friendly and better able to drive traffic to individual builders. In the longer term, we hope to achieve greater recognition in the national and international communities, build our membership and sponsorship, explore new ways to get the word out about Maine Built Boats and have all of it translate into sales and jobs. "Basically, we&apos;re trying to increase the demand for all Maine boats - big, small, wooden, fiberglass, power, sail - the whole gamut."